The Russian Foreign Minister said that he wanted to implement the Minsk agreement in order settle the disputes with Ukraine, US Virginia Senator Richard Black told RT. Political analyst Charles Ortel also joined the conversation. 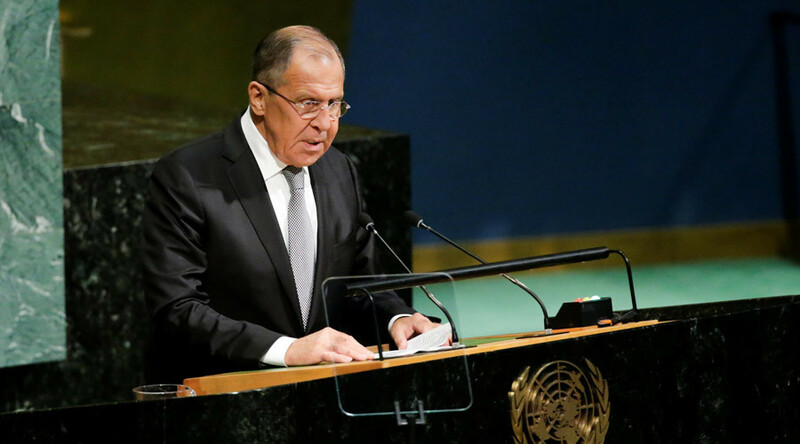 Russia's Foreign Minister Sergey Lavrov, during his speech at the UN General Assembly in New York, called on world powers to restart talks with North Korea, and deescalate the ongoing crisis. Lavrov also said NATO is seeking to revive the Cold War climate instead of building a dialogue with Moscow, saying that “some countries still prefer force to dialogue." RT: Lavrov touched on many issues in his speech, including what he called the revival of Cold War by the NATO countries, which how the current Russia-US standoff is often being described. What are your thoughts on this assessment? Richard Black: He did well by reviewing the history of what is taking place in Ukraine. He said to go back and recall that the roots of the conflict arose from the rapid expansion of NATO eastward to where it threatens the Russian border. There is no question that this is accurate. He said that he wanted to implement the Minsk agreement in order settle the disputes with Ukraine. But he did remind people that it was not Russia, but it was the Western-inspired coup d’état, which began the problems in Ukraine. That was a good reminder to people of how this started. He did touch on a couple of things that are happening in the Ukraine that have been problematic, and he said the suppression of linguistic minorities is a problem, because earlier on the new Ukrainian government did away with Russian as a second language. He also mentioned the current ongoing removal of monuments to heroes of WWII, which refers to some of the Russian monuments within the Ukraine. RT: Lavrov also spoke about sanctions as the tool of “undue pressure.” calling one-sided restrictions illegitimate, in the case of US sanctions again Iran, for example. Do you agree with that? RB: I thought that was interesting. Had I written the speech myself, that would have been one of the issues. The world came to an agreement with Iran to deal with the sanctions and to lift the sanctions. Because of some internal backlash the US has been moving away from the sanctions arrangement that was made with the UN and with other nations. There is an inclination to unilaterally impose new sanctions on various countries. This is not helpful. It leverages America’s power over the world monetary system in a way I think is counter to the interest of many nations. He was very correct to point that out. I do not believe that unilateral sanctions are helpful. In fact, I would say that sanctions as a general principal harm individuals and not governments, and they tend to be very counterproductive. RT: Sergey Lavrov called for a resumption of international talks to resolve the North Korea crisis. Do you think Pyongyang is willing to negotiate? Charles Ortel: No one really knows perhaps, other than the closest inside circle inside Pyongyang, what that leader really intends to accomplish by his belligerent approach. I had the fortune of listening to Foreign Minister Lavrov’s speech, and what I would say as a headline is: with 193 nations around the world, the number of flashpoints that he identified is actually relatively limited. In almost each of the cases he identified, while North Korea at this minute is front and center, there are elements of a reevaluation, a rejigging of relations between Russia and the West and our allies over a resolution in these different flashpoints that he discussed. He made excellent points on the Minsk Accords, on Ukraine, and on the fact that we in the West may not fully appreciate – the present context in Ukraine as against a longer period of years. We have made progress jointly with fits and starts in the Middle East, and we share common objectives there. So we’re working together there. I think Russia could do a lot to help in the tense relations with Iran. In so doing perhaps bring greater stability throughout the Middle East in places where Iran - in the West’s judgment - is meddling. With those steps in place, I think we can come closer and closer to a lasting potential peace in the Middle East. As far as Venezuela and Cuba are concerned. The position that Trump was trying to articulate is that when you look at the decades of suffering in Cuba, and then when you contrast the present position of Venezuela with what it was like 20 years ago, when it was a very prosperous, looking forward country – you have to look at that history with a great deal of sadness. I think, parking North Korea, where the world now watches and waits to see what the leader in Pyongyang is going to do. I thought that Foreign Minister Lavrov’s points were very well taken, very grown up, refreshing. I am glad to see that Rex Tillerson and our people, by all accounts, are developing a better relationship working together with his team. Let’s hope for the best. RT: The Russian foreign minister also spoke about the conflict in eastern Ukraine, and called for global support for a UN peacekeeping mission. Do you think other world powers are willing to cooperate with Russia on this issue?